Soon-to-be parents can spend hours designing a nursery, but most overlook the right lighting for the space. Having a baby is a thrilling time, but before the baby comes there are probably a million things you are trying to check off your to-do list. The nursery is one room that soon-to-be-parents mull and marinate in — because once that baby comes, all of your energy is spent with them. If you are making the final touches on the nursery, don’t overlook lighting design. Optimal indoor lighting is beneficial for both you and your new baby. The last thing you should be thinking of when the baby comes is how to best layer the lighting in the nursery! At Shelby Design Center, we want to make lighting design effortless so you can get the best lighting and check it off your list — before the baby comes. 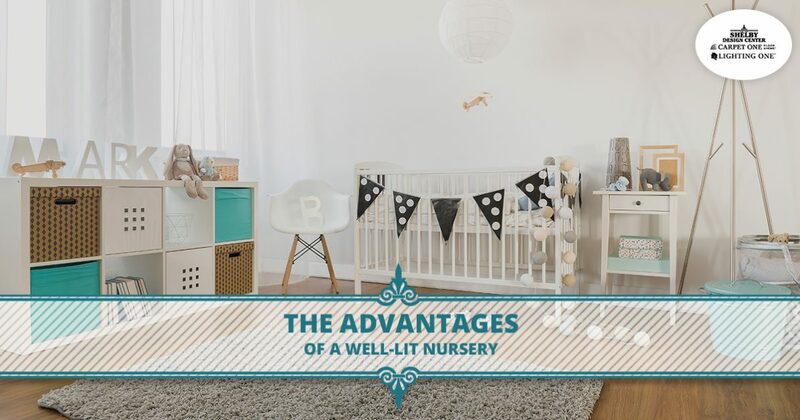 Take a moment with us today and explore the advantages of a well-lit nursery. Spend a little extra time on lighting now, so you can cherish your little one in a calm and inviting space. Leave the harsh and unwelcoming lighting for the doctor’s office! Use warm-tone light bulbs in accent lighting around the room to create a cozy area. 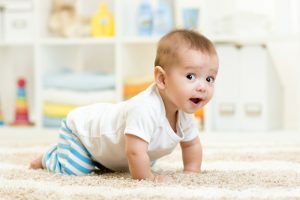 Warm lighting is a great option because it reduces the contrast in dark and light, thus reducing overstimulation to the baby’s eyes that are still getting accustomed to this world. Where you might not need a dimmer in other rooms, installing a dimmer in the nursery just makes those first few weeks with a new baby more manageable. A dimmer helps your little one into a dreamier state by signaling to the body it is time to rest and makes the environment soothing and calming. A dimmer comes in handy for parents and caregivers because you can catch a glimpse of your baby’s slumber, without having to turn on a harsh, overhead light. It is also beneficial for late night feedings and diaper changes to help keep your baby in a sleepy state. Floor lamps conjure a beautiful and unique style, but when they are placed in a nursery they are an accident waiting to happen. Think of rushing to your baby’s side when they’re screaming, only to knock over a lamp and cause more commotion! Reserve task lighting in tableside lamps and incorporate accent lighting with sconces. Even when your nursery is lulling and peaceful, it can seem scary at night for a little one and for a zombie-parent stumbling into the room late at night! Find refuge in a little night light to help calm your baby and prevent stubbed toes! Lighting design is crucial to how we go about our daily lives and it can make or break the ambiance and functionality of a room. Create a space you can bond and enjoy with your new baby by skipping the harsh lighting, implementing a dimmer, skipping the use of floor lamps, and using a night light. Find a wide variety of indoor lighting for your nursery when you partner with us! Shop our lighting collections today!